Expo Explosion III. Saturday, March 30th, Expo NM. 5 pm Doors. 1st Bout 6 pm. 9 Fights: Jose 'Pitbull' Torres vs. Fransisco Javier Castro, Willy Villanueva vs. Matthew Esquibel, Jose Luis Sanchez vs. Joe Gomez Martinez, Aaron "Angel Baby" Perez vs. Isias Martin Cardona + more! All Age Event. No refunds or Exchanges. *Cards subject to change without notice. IN ORDER TO SELECT A RESERVED SEAT, YOU MUST CLICK ONTO THE SEAT, THEN CLICK AGAIN BELOW IT TO THE PRICE IN ORDER TO ADD IT. IN ORDER TO SELECT A GENERAL ADMISSION BLEACHER SEAT, CLICK ON THE BLEACHER SECTION YOU WANT, THEN GO OVER TO THE RIGHT TO THE SELECT BUTTON, CLICK THE DROP DOWN MENU, THEN SELECT THE BLEACHER SECTION YOU WANT! PLEASE CALL 505-907-0505 FOR CUSTOMER SERVICE IN PURCHASING SEATS! 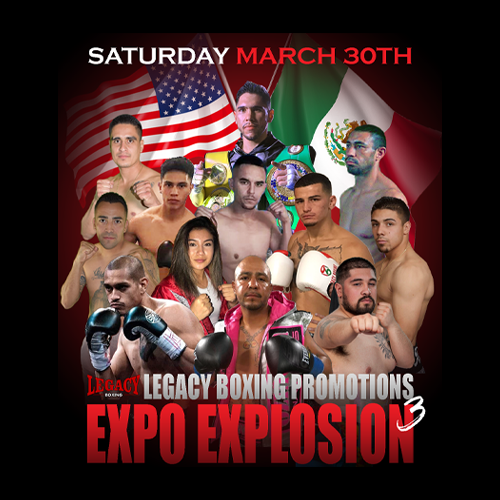 EXPO EXPLOSION III Saturday March 30th at Manuel Lujan Jr. Exhibit Complex. 300 San Pedro NE Albuquerque, NM 87108. 5 pm Doors. First Bell 6 pm. © 2019 My 505 Tickets. All rights reserved. Get the POWER of AGM's 7 Albuquerque Radio Stations behind your event and organization! Partner with AGM to get access to the only ticketing platform that has a monthly audience of over 1.5 Million in the greater Albuquerque area!